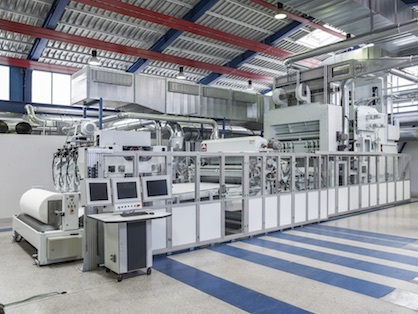 During Techtextil, visitors will experience the economic and technical advantages of Autefa Solutions as a full line supplier for carded- crosslapped needlepunch lines, aerodynamic web forming technology, spunlace, and thermobonding lines. Autefa Solutions nonwovens lines meet customers’ requirements for quality web formation, bonding, active weight regulation, and minimal maintenance. The recently delivered complete line to IDEAL Automotive GmbH, an international system supplier and development partner for the Automotive industry, covers the need of the highly-competitive Automotive market. High-speed and an improved quality have been set as key targets by the customer. Carbon and glass fibers reinforced plastics as well as composites with natural fibers result in extremely light and stable components. Autefa Solutions shows innovative solutions for the processing and recycling of carbon-, glass-, aramid- and natural fibers. Since 2010 the company is concerned with the re-utilization of recycled carbon fibers to carbon fiber nonwovens and has already successfully placed production lines in the market. Based on the reliable technology and the long-standing experience of the former company Fehrer in Linz, Austria, AUTEFA Solutions delivers high innovative Stylus needle looms with the Variliptic drive concept (elliptical needling) and with the NL drive for vertical needling. The Stylus needle loom improves the web quality, by reducing the draft especially in the pre-needling process, increases the machine durability and minimizes maintenance. Hydroentanglement is the ideal method of producing nonwovens for the strong growing wipes or cotton pads markets. Autefa Solutions has developed and patented the V-Jet injector. The V-Jet injector is installed in several productions and led to significantly higher tensile strength at same entangling water pressure than a standard injector. The possible reduction of water pressure is in the range of 20 %. In addition, the water consumption is reduced by 10 % when using the same nozzle diameter and pitch. The new Square Drum Dryer SQ-V combines the advantages of a horizontal dryer with the lower space requirement of a conventional drum dryer. The nozzle system uniformly distributes the airflow in terms of speed and temperature throughout the whole working width, providing best spunlace web and surface quality results. The Square Drum Dryer SQ-V has different heating zones and operates each heating zone with optimal drying conditions. Due to the small footprint the Square Drum Dryer SQ-V is the ideal solution for energy optimizing of existing lines.